His praise will continually be in my mouth. let the humble hear and be glad! He delivered me out of all my fears. and delivered him out of all his troubles. Just wanted to share with you this incredible picture (and quick update) of Musoke, a little friend that we have been nursing back to health. Musoke and his dad have been staying with us while he recovers from severe acute malnutrition and gets started on his ARVs and tuberculosis treatment. As you can see, our Mighty Father has revived him from the brink of death and he is well on his way to recovery. We will be sad to see him go but so excited for him and his father as they transition into their new life healthy and happy! Just this week, Musoke got the chicken pox. Chilcken pox is usually more severe in children with HIV, so we would really appreciate your prayers. Please also join us in praying for his father's salvation, and for Musoke's. His continued restored health is certainly a testimony to the wonderful Savior we serve! What a transformation! Prayers and God's blessings!!! Praise the Father!! Praying for this sweet little boy. Katie, You have made such a difference in this young boys life! You are such an inspiration and a role model for me! My prayers are with you, your ministry, and your family! p.s. Thank you and the women of Masese for the beautiful beads! I love them! What an amazing difference. There's not only the physical changes, but you can see the hope in his eyes that was decidedly missing before. Praise the Lord! What a mighty God we serve who so dearly loves the children. Praying He will heal Musoke from the chicken pox and that Musoke and his father will know saving grace. Bless you for all the works you have done. Matthew 19:29 "And everyone who has left houses or brothers or sisters or father or mother or wife or children or fields for my sake will receive a hundred times as much and will inherit eternal life." Just finished your book....my life has not only been touched but forever changed!!!! Praying for this family....will continue to pray for you!!!!!! Amazing! Praising God for his return to health and praying for the chicken pox. How incredibly our King works! This just so happened to by my Psalm of meditation today. I love you Katie, praise the Lord for Musoke, and continue to pray for all He is doing where you are! Praying for you, your children, Musoke, and your ministry there. It's a blessing seeing how the Lord is using you because of your everyday obedience to Him. He's using you in Uganda as well as in the hearts of people here in the States. I just started reading your blog and I am truly inspired. As a 16 year old struggling with what path God wants for me and a heart for foreign missions, your story has given me new strength and new hope that this might be what I am supposed to do. Thank you for the amazing work you do for the kingdom of God, I can't wait to worship Him as sisters in Christ in heaven some day. Praying for your children, your ministry and your sweet friend with the chicken pox! And thank you, dear heart, for opening your heart and home to those who need it. Will definitely keep him in my prayers. I am praying for them right now! Keep up the good work! I just prayed. He looks like such a sweet healthy young man. Our God is so good! We will definitely be praying! The picture just blows me away. God is so good! Have been waiting for an update on Musoke--will continue to pray! Thank you for being the hands and feet of Jesus in Uganda. His eyes (and fattened cheeks) say it all! This is so precious! We serve such a faithful God! Praying for him and his father's salvation! You're such an inspiration! God bless! What a wonderful blessing. God is good ~ all the time! May the Lord continue to bless the work there and draw many to Him giving new and abundant life. Continue to lift Him up so others will be drawn unto Him. Have a wonderful day in the Lord ~ blessings. What an amazing transformation! One that I hope leads to a better one...one of the soul. The Lord is able to do the impossible. Praise His name and I will be praying! What a beautiful answer to the many prayers. God bless you & your work. for he knows our frame ... looking forward to hearing you speak friday. texas is gonna love you! Praise God! I cannot believe the transformation in that little face. You would never know from looking at the pictures separately that they are pictures of the same child. I am especially in awe of the transformation in his eyes. They reflect the love that he has been given. This is what has truly transformed this young man. My family will be praying for his salvation. Thank you Katie, for continuing to love others in Jesus name. Wow, what a difference. Praise the Lord. Our family just read your book Katie and it was so moving. So glad we can still peak into your life through your blog. We'll keep you and those you are loving and serving in prayer. What a beautiful boy! And what a tranformation! I love what you do for these children through HIS love and strength and guidance. Thank you for what you do! I will be praying for this little guy. What a great way to start the week, hearing about how awesome God is. Thanks for the post! Praise God! What a wonderful testimony of God's faithfulness! What a mighty God we serve! I can practically see God's fingerprints all over! Praying for this precious soul and for his father. Thank you, Katie, for loving God and your fellow man so much. You are who we all should strive to be. I will definitely be praying for this little guy! I wear my Amazima beads everywhere (and get the opportunity to tell SO many people about this ministry because of all the compliments!) and I pray for this ministry and the child I sponsor. I'll add him to my prayer list! Beautiful transformation story. All glory to God! Praying for your friends and family, Katie. He is so handsome! Thank you for the update! And praise God for moving in Musoke's life and beginning to plant a seed in his father! He looks like a completely different young man...there is a sparkle in his eyes now. Praying that God continues to use you and His ministry in a mighty way! Thank you for the update. I have wondered what became of this little boy. Prayers will continue to be said for him and his father. I just wanted to let you know you have inspired me more than anyone else in my lifetime, and to think I have not even met you, that just shows what wonders the Lord can work. I will be praying for you and your ministry, and I cannot thankyou enough for your service. Praying for Musoke. What an amazing transformation! He looks WONDERFUL!!!!! Praying that he and his father will come to love Jesus. He looks so handsome and healthy. What an amazing change in the pictures! Praying for Musoke and praising God for the healing He has done. Thank you for the work you are doing. My family and I are praying for your work & about how God will have us help. I will pray for sweet Musoke. Thank you for writing. I know you are so busy but I still love to read what is going on. God bless you!! Recently read your book and am enjoying your blog so much! You are an inspiration to me and have encouraged me greatly in my walk with Christ! Much love to you and your family and will continue praying for you. I really hope he will get better, but he the big difference is beautiful. Oh my goodness! You have done so much for this family. You are a role model that any one should be proud to look up to. I hope and pray that the little boy gets better and that you or your family get sick. Wow--you would never know that was the same child unless someone said so! How miraculous! Just said a prayer for his healing from chicken pox. Blessings to you for all you do--I found your book so inspirational and hope to meet you when I travel to Jinja someday! Just incredible! I praise the Lord with you, Sweet Katie! I recently read your book and was cut to the core. The last chapter had me sobbing. I turned to the Lord with thanksgiving for the blessings he has given me. May the Lord use us!!! Bless you, infact, I can see that He already has and continues to do so everyday. Oh the difference in him! How precious the work you are doing. Praying for you, sending support. Thanks for posting this awesome report. Bless you and your ministry. Masuke and his father are in our prayers! Prayers for Musoke, his father, and all of you! Thank you for your obedience and for sharing this life of yours and theirs with all of us. My son Tucker (6 yrs old) & I pray for this little boy daily...so happy to hear this update! We will continue to pray for him & his father. "Love suffers long and is kind; loves does not envy; love does not parade itself, is not puffed up; does not have behave rudely, does not seek its own, is not provoked, thinks no evil; does not rejoice in iniquity, but rejoices in truth; bears all things, believes all things, hopes all things, endures all things. Love never fails...now abide faith, hope, love; but the greatest of these is love!" I (along with my husband and our 3 children)am a missionary in Lesotho, Africa at an orphanage for children from birth to age 5. Your blog post made me cry today as we have a young boy who came a month ago to our care center. He is around 5 years old and wears size 0-3 month pants. God is good and He is the Great Healer. 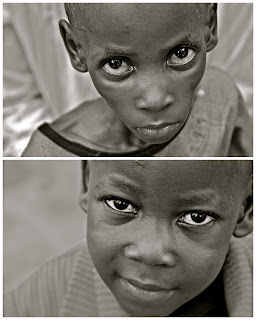 Seeing this young boy's picture restores my hope for our young boy's future. Thanks for being Jesus' hands and feet to His precious children in Uganda! Praise the Lord! His transformation is incredible! He is a very blessed boy to have both you and God on his side! We will be praying for his chicken pox and for his father. Also that his improvement will continue once he is home! Blessings! Hi Katie! Thank you for continuing to share your struggles, as well as your triumphs. My husband and I will pray for Musoke and his father. On a personal note, I am leaving the U.S. for a short-term mission trip to Central Uganda in June and am both encouraged by your book and saddened by the realities of what I will see and experience there. When people ask me why I am going to this particular place and why we keep pushing for child sponsorships, I have been pointing them to your book and to what I can no longer ignore. Your blog and your book tell the truth of what the rest of the world is like and what the love of Christ can do with and through our brokenness. Thank you. That is an amazing transformation. I am praying for his continued healing. Hello Katie! I am almost finished with your book and I just wanted to let you know that you are a HUGE encouragement to me and my family. You have great strength even on the hardest days. We continue to pray for you and your girls every single day. You are making the Lord's name known and that is the most wonderful thing you could ever do. 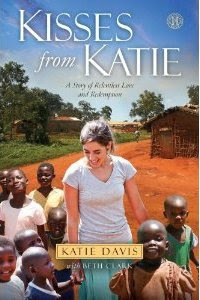 -Ashton W.
Katie- I am almost finished with your book Kisses from Katie and I wanted you to know that you are a major encouragement to me and my family... We live what you are doing in Uganda and your mission must seem impossible. I wanted you to know that with God all things are possible. We continue to pray for you every day and I will tell my family about Musoke and his father. Thank you!!!!!! This was very encouraging to see, thank you for sharing your ministry with us! This was very encouraging! thank you for sharing your ministry with us! Katie, each day I pray for you and for those you touch with the beautiful hands and heart that God gave you. I pray that the Lord continues to BLESS you and all the beautiful souls in Uganda. He is smiling down on you now, so proud of you. Thank you Jesus for healing Musoke both inside and out...now we hold Musoke's father up to you to heal him too. PTL! I will be praying! So thankful and encouraged by the work that you do!Wish that I could come see it in person! Maybe one day! wow , that is a remarkable turn around. Praising God with you. It's so good to see what God has and is doing in the lives of others. Thanks for sharing. Praying for you, your family, and ministry. Much love and many hugs to you. Prayers for Musoke. And for all suffering all over the world. OH HALLELUJAH! THIS JUST MADE MY DAY. Tears of JOY!!!!!!!! Thank YOU JESUS!!! Standing with you in prayer and support my dear sister in Christ. Dear Katie, My beautiful son Stewart Orme was like you and dedicated his life to God and he was very inspired by your good works that led him to go on his second trip to Uganda in 2009 where he spent 6 months. He has 2 sponsor children in Uganda. Sadly Stewart died on April 29, from injuries he received in a motor bike accident, just 4 days short of his 24th birthday. He achieved so much in his short time with us. I am reading your book at the moment "Kisses from Katie", which was his favourite book and it gives me great comfort. I was saddened to hear last night that he never had the chance to meet you but I know you will both meet one day in heaven when it is your time to meet our Lord. He has inspired me now to visit Uganda and to do God's will over there. I visited him at Easter before the accident and told him about how I had always wanted to go over there but never had the courage but I was so proud of him for all he did. Now I have the courage and I will go over there as soon as I can. I hope I can meet you sometime because you are a true inspiration. Thank you so much for all the work you are doing in Uganda and especially for being such an inspiration in my son's life. Praise God!! He is so good : ) It must feel so good to have all these people praying for you and your people. Be encouraged to know that you are not bearing your burdens alone. I will be praying for these two : ) Blessings from Florida!!! We do serve an amazing God. Such a sweet little boy. I am praying for him and his father, that they might begin a new life with the Savior who has healed and who loves them. I LOVE my bracelet and necklace. I pray for the dear women who made them. They are so beautiful! Jevoha Rapha, please extend mercy to your little one! Thank you for the progress He has made! For your glory and names sake please have mercy on him and his father and draw them to You! The smile on his sweet face in the second picture says it all! God is miraculous. Will pray for his continued health as he fights off those pox! Katie, I love reading your blog. I just picked up your book because it is a must read for our missions team before we come to Uganda, I am in the process of raising money to come there next February 2013. I am so excited to see what God is going to do. I can't believe that's the same child! Thank you, Jesus! In case you didn't know, you are a big celebrity here in Brentwood! I keep trying to tell everyone about you and what you have done, but everyone already knows you!! They say: oh yeah, katie, I've read her book!!! oh yeah, I've bought the necklaces, I read her blog etc.. So amazing to know how many hearts you have touched and the love keeps spreading! Thank you for what you do! Praying for you, your little friend and 14 little princesses. Happy Mothers Day Katie!! I have just finished your book. I can't keep your ministry, children and you out of my prayers. You are the New standard for mothering. Congratulations for representing our Savior with so much integrity! Blessings on this Mother's Day! I have started your book and I just love it. it makes me think about how much I have, and how much I want to give. Thank you so much for telling all of us about your family! I wish I could meet you some time. Remembering and thanking God for godly mothers today. I am so encouraged by your walk with the Lord and how God is so greatly using you in Uganda. Your faith in action is such a blessing to me and so many! I'm 19 yrs old, and I recently finished reading your book. Thank you for writing it. I can't believe how ignorant I was to the suffering that human beings go through in other parts of the world, I know I've been in deep denial about it too. Reading your book has rocked my world upside down. I wish I could be more articulate in expressing the effect it had on me. Please know that I am seeking god and a relationship with him, and your book has helped me profoundly. I heard about you from some friends who took a six month missions trip to Uganda last year. (They came to work with the Kehns in the ABIDE program.) After reading your blog, I was SO moved by what God was doing in and through you that I forwarded one of your posts to the Young Adult Group at our church. How awesome for those "20 Somethings" to see someone their age being so surrendered to God's calling and work. I was especially in awe at what God was doing in your life because at the age of 18, when I was planning on going on a short term mission's trip to Africa, I did something incredibly foolish and decided to walk away from the Lord. I subsequently sqaundered over four years in the pig-stye of the world. I have since come back to the Lord and He has made beauty from the ashes, but those prodigal years(the "inheritance" of my youth)are lost forever...so many "good works" were lost and it is my passion that young people see the enemy for who he truly is - "a lion seeking whom he may devour". I let him devour precious years of my life, and the pain of that loss makes the testimony of your great gains for the Kingdom that much sweeter. Also, as a mom to six at home, I can't even begin to tell you how TREMENDOUSLY encouraged, convicted, and inspired I have been by the mother's heart that God has worked in you. I love my children, but the seeds I sowed to my flesh for so long reeped a great harvest of selfishness and selfcenterdness. Take someone so self-absorbed and throw her into a calling that demands sacrifice, and let me tell you, it hasn't been pretty. But I am persevering, knowing that "it is God Who is at work in (me) both to will and to do for His good purpose..." He has used you mightily to stir me to press into Him for EVERYTHING. Thank you for your obedience, surrender, transparency and willingness to be broken and poured out on behalf of the One Who gave ALL of Himself for us. God gave me an idea that I wanted to share with you and those who follow your blog. At our church, we are going to be hosting a Women's Breakfast where your jewelry will be "on sale" for women to purchase (much like a Jewelry Party). We are going to hold it in September so women can purchase early Christmas presents. Have you ever considered putting together a simple catalogue (like Gospel for Asia does) that could be passed out to those who don't have access to the Internet? May God sontinue do "exceedingly, abundantly, above ALL that you could ever ask or imagine. To be able to do this simple collage of photos has no name. First it's such a priviledge to have the pictures, but even more to own that past full of hope, but most of all the heart and love. God bless you. This is true preaching. I will be praying for both father and child. Katie you are such an inspiration I just got done reading your book and loved every minute of it. INCREDIBLE! It leaves me speechless. Just amazing what Love in all its forms can and will accomplish. As a foster parent here in the States, you have been an inspiration. While I have bonded with my kids I have tried to keep up a small wall to keep myself from falling completely in love, only to hurt when our kids go back to their families; although that is exactly what we work towards. You have taught me to trust more in the Lord, let go, and allow him to lead me; even though I thought that's what I had been doing all along. The wall has crumbled and I have found that it wasn't a very strong one to begin with. Bless you and thank you for opening my eyes, for now I have jumped in whole-heartedly and I know that in the end, when it's time to say good-bye to this bunch of kids, the Lord will take care of my hurting heart and I will be even stronger the next time. I pray for you, your adopted girls & wonderful ministry as regularly as I can. May God bless your socks off!! I began reading this blog 2 weeks ago, right from the start. Now that I'm all caught up I'd like to pray an immense blessing over you and your precious family, over Amazima Ministries and all the wonderful work your group is doing. Thank you for keeping my eyes, mind, and heart on the things of this world that need prayer and action. Hi Katie, i'm from Brasil and I read your book and I felt in love with your story! I'm 16 and I wish someday I can make difference like you do. How can I talk with you and ask you some questions?! I really want it. Be sure i'll pray for you and your childs everyday, and the Lord will hear me and make it possible when it's time. Kisses and hugs from someone who loves what you do. Thanks for sharing this Katie. I was in Uganda exactly when you posted this and wished I could have visited as we went through Jinja as we went to Musana for a visit and I know we were close. I praise God for your mission and for the Mighty Hand of Gad as he uses you and Amazima. I am praying for Musoke and wait anxiously for a good report on his health. Hi Katie, my name is Brooklyn. I'm a missionary kid to Ecuador so I know what it's like to get up from your home and just leave to another country. I think u r amazing with all that you're doing! I just read your book and I can't imagine what it's like to have 14 girls but I'm sure it's a lot of fun most of the time. Thanks so much for all your doing and I'm praying for your family and Uganda! Oh and by the way I'm 13. I went to school not knowing what I really wanted to do and fell in love with service. Fell victim to society's expectations and went back to school thinking that well I could be a teacher and make a living and serve. Finished school second time and failed to find that spark in my life failed to find the thing that I felt that God wanted me to do. Then I realized I was not on the journey God had meant for me. I'm serving and working now with children who need the love and commitment of people who care and I'm not gonna get rich and the hours far out weigh the pay but I am happy and it feels right. I cannot imagine anything differrent at this point. Your book truly inspires me! Think you for being the light and love God has to offer us! I am a 11 year old girl. I want to be just like you only go to Mexico. I have been there 3 times. I have 2 adopted siblings and 2 brothers. I got your book and just stared reading it. Katie, I prayed for you, your kids, your ministry today. May God stir more hearts to uphold not only Uganda but you as well. Katie you are such an inspiration! I'm so in love with your book also! It's so remarkable what God is goinfg through you! You daughters are blessed with yours and His love! May you always be covered in prayer and love! I am glad my mom let me post a comment because i am amazed by you katie. you make Uganda sound like the most amazing place in the world. it is amazing that you have opened up your home and your heart to so many people. These are hope-generating photos that encourage my faith as well...just seeing his face before and after, and knowing that what has happened to bring this one child back to health and hope can happen for so many more as well. It encourages me (and surely other believers)to help you help them; not only because it brings hope and life back to these children, but because your love and care reveals to each child how much our God and Father loves each one of them as well. Levis Snapback Hats. introducing some of our websites :http://www.wholesalehatsandcaps.com. Katie I read your book and have been reading your blog for the past few weeks (started all the way back in 2007). These pictures brought tears to my eyes. What a beautiful little boy he is and what a wonderful God we serve. Thank you for sharing all that God is doing in Uganda. It has been an inspiration as well as a challenge reading your stories. I will be praying that God will continue using you to do amazing things for these great people. You are an amazing soul. Reading your entries just brings tears to my eyes. God bless you.